Home > TechEntice Byte > World on verge of Organ banking, what about India? In the country of second highest population, there is little hope for the organ transplantation patients and it is real painful and shame! Sapna Dupare, a 27-year-old engineering student, cannot carry out most of her daily activities as she is suffering from kidney failure since three years. She has to depend on her elder sister to bathe her. She is too weak to take up a job although her family needs economic support. Her condition continues to worsen even after dialysis twice a week. There is no solution in sight for her as unfortunately due to varied reasons. No one from family can donate a kidney to her, her only hope is a cadaver or deceased organ donation. But the waiting list and inappropriate organ allocation model in country has made it worse. Additionally there are so many constraints that creates problem in flexible and efficient transplantation. Like for example, every time an organ donor dies, a timer starts counting down, i.e. once a surgeon removes an organ from a body, it can only survive for about 36 hours. Usually 4 hours for heart, 12 hours for liver and 24 to 48 hours for kidneys are acceptable cold ischemia time. There are so many people loosening their lives because of unavailability of an organ at rite time! If scientists can find a way to lengthen organs’ shelf life, they could be set aside, creating a stock for when patients need them. Doctors could also take the time to repair tissue, turning more organs into viable donations. And if a transplant didn’t have to happen immediately, a recipient’s immune system could be slowly acclimated to the new organ’s cells, making their body less likely to reject it. One method to preserve organs looks to essentially freeze-dry them for quick, convenient storage; the other wants to change how their cells and tissues operate, nudging them into a hibernation of sorts. The former would be faster, and the latter would probably be safer—but both methods have their obstacles. Hopes had reached to limits when Greg Fahy in 2005 successfully cooled a rabbit kidney down to a vitrified form—a glass-like form of stasis. Vitrification is an intensely fast process that avoids ice-crystal formation—it’s the same way doctors preserve human egg cells and embryos. Many thought that this breakthrough would show the path for whole organ preservation, but unfortunately it did not turn out to be true. 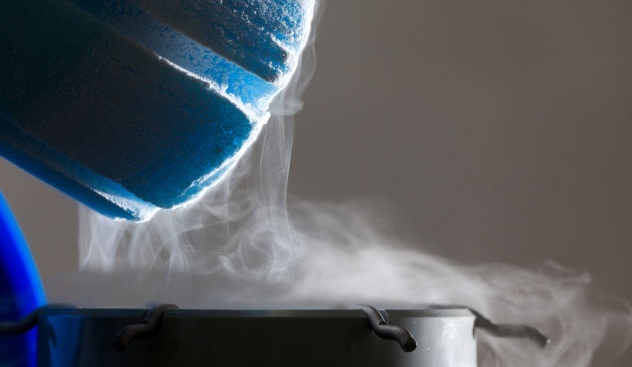 The most popular organ-preserving method being researched is cryopreservation—the deep freeze of living organisms or organic material, usually with liquid nitrogen. John Bischof who is Nano engineer at the University of Minnesota, working on cryopreservation, thinks he’s found a solution to the problem. He proposes dropping vitrified organs into cryopreservant—basically, anti-freeze—that contains magnetic nanoparticles. When they’re exposed to RF waves, the nanoparticles start vibrating, heating up the solution by over 100 degrees Celsius per minute and warming the organ from within. However, cryopreservation is tough, for the same reason that previously frozen meat doesn’t taste as good as fresh meat, same goes with Ice crystals. When crystals form, they damage cells and tissues, making an organ impossible to transplant. There are various other researchers who are trying out on various stuff like to avoid ice formation by freezing organs—without technically freezing them, isochoric cooling: which lowers temperatures in a preservation chamber by increasing pressure while retaining the same volume. Although, Cryopreservation is a real technology, there are other main strategy being considered to preserve organs is straight-up science fiction. According to Carleton University’s Ken Storey, “Most vertebrates with a backbone can turn themselves off completely, live in suspended animation, and come back to life.” Instead of putting an organ in a subzero deep freeze, Storey is investigating on how to “stop biological time” of organ. He wants to turn an organ off like it’s hibernating, and turn it back on when it’s ready to be transplanted. That’s easier said than done. Most mammals that hibernate do so when changes in the environment activate cell pathways that start to shut down the energy components that break down fats and sugars for fuel, and DNA-related activity that leads to the creation of new proteins and destruction of old ones. But in humans, these pathways can’t be turned off—they just shift in a different direction that keeps them functioning, or the cells will start undergoing a programmed process of death called apoptosis. However, Storey believes that key to achieve this is identifying the one to two percent of cell functions that stay on to keep the body alive during stasis. There are so many scientist throughout the world who are working on same. Let’s hope for the sake of those struggling, there is some kind of solution to this problem. However, finding solution to Organ preservation is not just the solution required, there needs to be proper infrastructure for the transplantation, there are so many instances where the proper organ is available for proper patient, but it eventually won’t work out due to inappropriate structure. Let’s hope that this would reaches to someone who can make the change and bring the proper structure into place!